So I mentioned last week that I started a new workout program. While I knew it would be a challenge to get back into shape, holy cow I did not realize how much of a challenge it would be physically and mentally! I blame myself of course. I mean, what did I expect – I haven’t exactly done anything along the lines of “fitness” since I had to fit into a wedding dress…and that was a year and a half ago! Well, I’ve learned a few things with my new schedule, aside from the fact that sports bras are my friend. During the week, the two things I learned the hard way were A – eating dinner before working out isn’t ideal for me and B – cooking dinner after working out isn’t ideal for me. Quite the conundrum, right? So how do I eat dinner after working out (so that I don’t feel it coming back up on high cardio days) without having to make dinner after working out (so I don’t writhe in pain when I lift a saucepan after doing a zillion push ups)? Enter the wonderful world of casseroles. I’ve had a few written down and decided week 1 would be the perfect time to try them out. 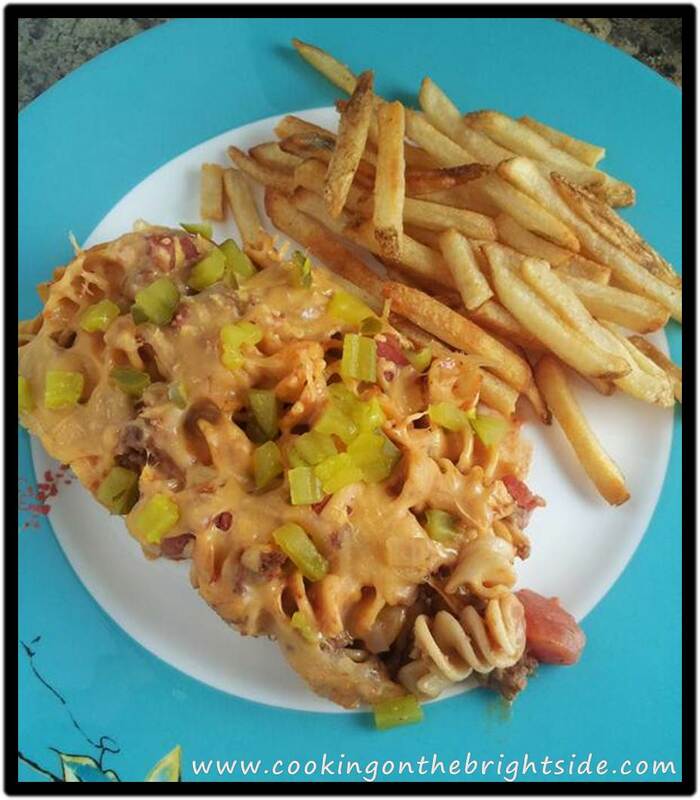 Thanks to one of my food blogs, Skinny Taste (also a big proponent of Weight Watchers! ), this casserole suited all of my needs! Quick, easy, delicious and healthy – I made everything ahead of time and popped it in the oven after my workout while I cried in fetal position showered! You should definitely try this one…it was great for a meal paired with some Alexia House Cut Fries with Sea Salt. Very slightly modified from original recipe here. Heat your oven to 350. Lightly grease a small casserole dish. In a medium saucepan, bring water to a boil and cook pasta according to directions. In a medium skillet, heat oil and cook onions for 3-5 minutes until softened. 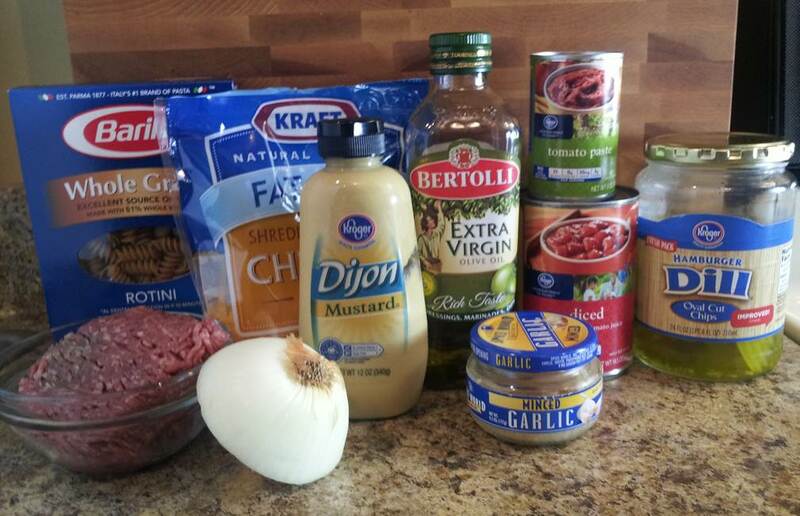 Add garlic and ground beef and cook through. Season with salt and pepper. Stir in tomato pasta, tomatoes and mustard. Let the mixture simmer slightly. Then add pasta and toss to coat. Add mixture to the casserole dish, spreading into an even layer. 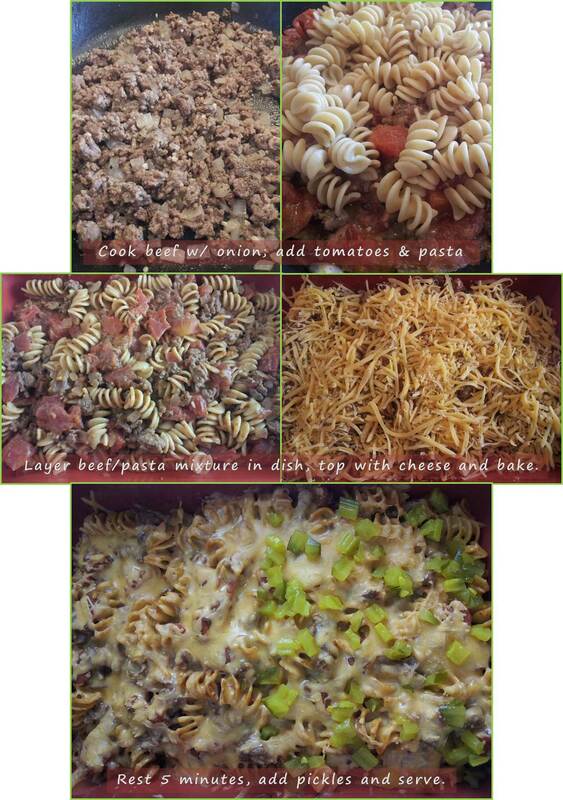 Top with shredded cheddar and bake 15-20 minutes. Let sit 5 minutes, add chopped pickles (only to one side if you have a family member who is a freak and doesn’t eat them) and serve. 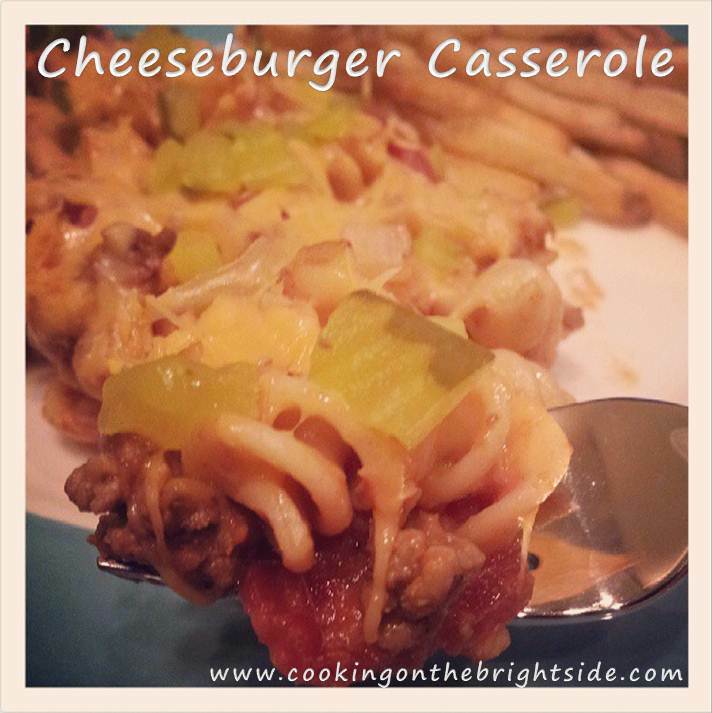 This entry was posted in Casserole, Main Courses and tagged comfort food casserole, easy casserole, healthy cheeseburger, healthy cheeseburger casserole, weight watchers casserole by cookingonthebrightside. Bookmark the permalink.